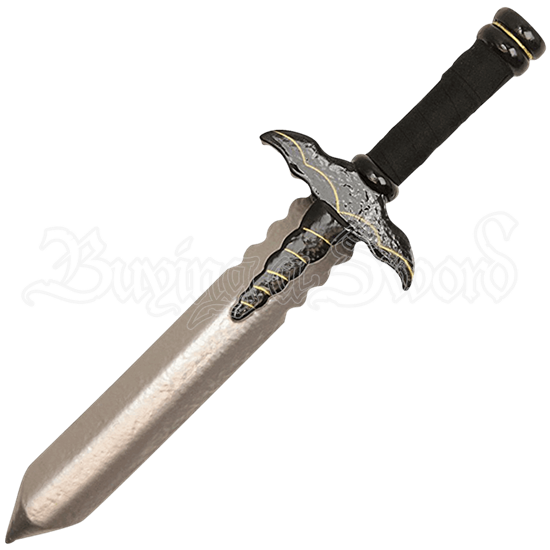 Whether you are a vampire hunter or like to carry weapons with a gothic aesthetic, the Gilded Bat LARP Dagger is a great offhand weapon for your arsenal. This gothic foam knife also makes a fantastic addition to any cosplay ensemble. Crafted from dense latex foam with a unique fiberglass fusion core, this fantasy LARP sword is lightweight and extremely flexible. The durable latex construction with painted details provides a realistic look for any cosplay or theatrical production. Designed to match the Gilded Bat LARP Sword (NP-G-L20), sold separately, this latex dagger makes a fearsome secondary weapon. The metallic silver blade features a wavy ricasso with a black and gold accent. The guard is shaped like a bat with its scalloped wings spread wide. With a cord wrapped handle for a secure and comfortable grip, this Gilded Bat LARP Dagger is suitable for light sparring.